While all eyes are on Rome as one pope exits and a new one is yet to be named, I’ve been thinking back to my visits to the Vatican. I’ve been lucky to have been blessed by Pope Benedict XVI not once but two times during his weekly general audiences. I’ve marveled at the near-perfect symmetry of Vatican Square, the sheer size of St. Peter’s Basilica, Michelangelo’s awe-inspiring Sistine Chapel frescos and even journeyed underneath the Vatican to the scavi, or ruins, to see what’s believed to be tomb of St. Peter. 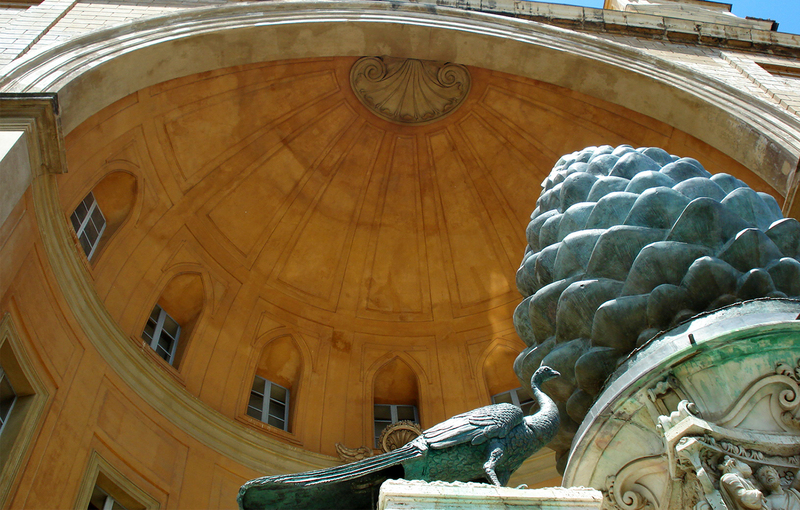 One thing that piqued my curiosity is the bronze pinecone and peacock statues in a courtyard at the Vatican Museum. What are these whimsical statues doing in one of the holiest of places in the world? The statues are located in what is known as the Belvedere Courtyard, which was designed by Donato Bramante beginning in 1506 for Pope Julius II to connect the Vatican Palace with the Sistine Chapel. Originally the courtyard had three levels linked by stairways and flanked by galleries that were slightly angled towards the Sistine Chapel, so that from the papal apartments the courtyard looked even bigger than it actually was. Would you expect anything less from the Vatican? Hanno the pet elephant given to Pope Leo X by King Manuel I of Portugal. Over the years, the courtyard became sort of a papal menagerie, a prime example being Pope Leo X who paraded his prized elephant Hanno around the courtyard for all to see. Bramante died in 1514 before the completion of the courtyard, and architect Pirro Ligorio finished the project in 1565, adding the niche at the north end with a half-dome top modeled after the Pantheon. This Cortille della Pigna, or Court of the Pinecone, is home to the infamous 13-foot-tall bronze pinecone statue, which coincidentally was originally part of a Roman fountain near the Pantheon. The statue was moved to the courtyard of the old St. Peter’s Basilica in the Middle Ages and then again in 1608 to where it stands today. The bronze peacocks that flank the pinecone are replicas of statues that decorated the 2nd century tomb of Emperor Hadrian. The originals can be seen in the Braccio Nuovo Gallery inside the Vatican Museum. Without giving you a Dan Brown-style lesson in symbolism, both pinecones and peacocks have had significant meanings throughout history. For example, the peacock has been a symbol for things like immortality, royalty, pride, renewal and the all-seeing eye of the church. There have also been references to peacocks as guardians of the Gates of Paradise. Similarly, pinecones have been associated with spiritual enlightenment, resembling the brain’s pineal gland (also known as the “third eye”), as well as eternal life since pinecones are bore from evergreen trees. The pinecone has also been mentioned in connection to the Tree of Life. And speaking of Dan Brown, the spiral pattern of a pinecone also mirrors a perfect Fibonacci sequence. So at end of the day, the Vatican’s pinecone and peacock statues demonstrate one of my favorite things about traveling – that things aren’t always what they seem, but rather there are layers of history everywhere we turn. I would really like to know what is so special about being blessed by the pope? He’s just a man. He can’t bless a person any better than you or I can. He has been (along with all the other Catholics) duped by a false religious system based on works, idols, and church tradition. I know. I used to be a part of it. Has anyone ever read about the religious system the Pharisees had going in the time of Christ? Sounds like the Vatican is pumping out the same damning propaganda. Instead of following and venerating another human, try following and worshiping Jesus – and Him alone. Only He is the way and the truth and the life. Not the pope, not the saints, and certainly not Mary. The “Pigna” is a symbol of Asaru. It’s origin – a temple of Ast/Isis says it all. There is no story of Ast without including Asaru. Being a vegetation god, the Pine cone, especially the UNOPENED Pinecone represents renewall literally everlasting life.. In this case a Pagan symbol – not a re-purposed Pagan symbol but a Pagan Symbol used by the HEAD of the Christian world in the same manner that it was first used in the ancient world.